With increased coastal development and rising sea levels, tidal marsh birds face many threats. Among the salt marsh specialists that nest in the northeast, Saltmarsh Sparrow is most vulnerable. This talk describes the status of tidal marsh birds throughout the northeast, and focuses on the specific threats faced by Saltmarsh Sparrows. Ongoing research on how to conserve these birds, the effects of Hurricane Sandy, and the effects of habitat restoration are also discussed. Chris Elphick is an Associate Professor in the Department of Ecology and Evolutionary Biology at the University of Connecticut. 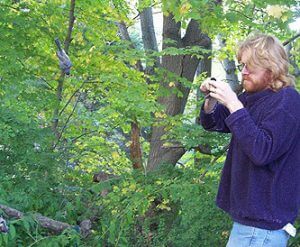 His work focuses on the conservation ecology of birds, especially in wetlands and agricultural settings. He has been studying coastal marsh birds and their habitats since 2002 and is a lead investigator for the Saltmarsh Habitat and Avian Research Program (SHARP), a collaborative initiative to study the ecology and conservation of tidal-marsh birds along the Atlantic seaboard. His research has been published in journals such as the Auk, Biological Conservation, Conservation Biology, Journal of Applied Ecology, and Science. Book length projects include the Sibley Guide to Bird Life and Behavior, the Atlas of the Breeding Birds of Nevada, and the Ecology and Conservation of Birds in Rice Fields: A Global Review.